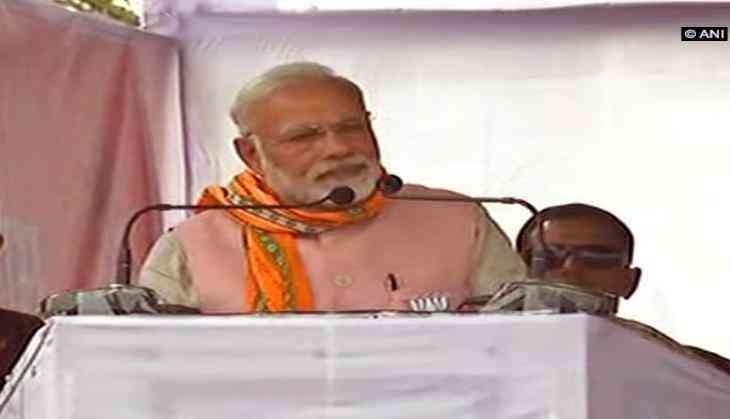 Prime Minister Narendra Modi on Thursday said that the Bharatiya Janata Party (BJP) has chalked out an all-rounder plan for Tripura, where the Assembly Elections will be held on February 18. While addressing an election rally here, Prime Minister shared the '3T' plan for the north-eastern state. "We are focusing on 3Ts for Tripura - Trade, Tourism, Training of the youth so that they get opportunities to shine," said the Prime Minister. Interacting with masses in their local language, Prime Minister called for the change of Communist Party of India- Marxist (CPI-M) led state government. Prime Minister Modi while raising the slogan 'Cholo Paltai' (lets change) said, "I know when the people stand up seeking revolution, then they uproot anything which, comes in the way of development, then may it be a government which has been ruling the state for decades." Taking the occasion to hit out at the Manik Sarkar-led state government, Prime Minister Modi said the people of the landlocked state have been deprived of their rights. "The government in Tripura has established an atmosphere of fear among the people who speak against them. Workers here don't get minimum wages, which the worker of the entire nation gets. I ask you shouldn't Tripura be able to avail the minimum wages facility? The communist are ruling Tripura from past 25 years, but they are not ready to give people the right to exercise their fundamental rights," he added. Asserting that the development era is about to begin, Prime Minister said, "Youth of this state wants employment. The government employees want the Seventh Pay Commission. Tripura wants to achieve new heights of glory. People here aspire to more and better employment opportunities." Attacking the chief minister and playing around with his name, Manik, which means the ruby gemstone, Prime Minister Modi said, "You all should get rid of Manik. You need 'HIRA' H-highway, I-I Way (digital connectivity), R-Roadway, A-Airway." Manik Sarkar is one of the longest-serving chief ministers of India, who, since 1998 has ruled that state, where a majority of the population speaks Bengali language. The BJP is looking forward to making in-roads in a small but significant state of the north-east.